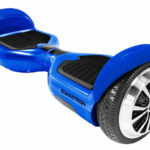 The popularity of hoverboards are increasing day by day that pretty soon it’s going to be a common thing for people to use this device as a much-preferred means of transport. They have become the coolest and stylish gadgets these days and are selling like hot cakes. Whether it is a Christmas gift or a birthday gift, people seem to consider these two-wheeled self- balancing electric scooters as a perfect gift for their loved ones. Lightweight and portable, they offer a great way to commute with tons of fun. Enjoying fun and exciting ride on the hoverboard is one thing. What if you can spice up your riding experience by improving the look and functioning of your hoverboard? Well, the good news is numerous hoverboard accessories can enhance the appearance, safety, and performance of your boards. Riding a hoverboard is indeed fun, but you can’t ride it all the time. There are times when you need to carry it around. A carrying case and bag comes in handy in these situations. Using a carrying case can help protect your hoverboard from scratches and damages when you’re not riding it. Although hoverboards don’t weigh much, using these bags, help to distribute the weight evenly on both the shoulders. If you don’t want to carry the hoverboard on your shoulders, there are bags that come with wheels and handles, making it much easier to transport the device. 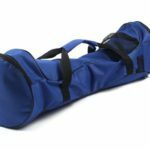 The Swagtron Hoverboard carrying bag and case is a useful accessory that is durable and made of lightweight materials, thus making it easier to transport your board. It comes with mesh and zipper pockets that allow you to store things like the hoverboard charger or your personal stuff. The handle of the bag is collapsible, and the straps can be adjusted to suit your requirements. While riding hoverboards, it’s important to stay safe. The hoverboard is a hands-free device that can easily be maneuverer just by leaning your body forward or backward. If you’ve mastered the device, riding it is very easy and safe. However, accessories like safety handles add to your safety by helping you maintain your balance and also control the speed. 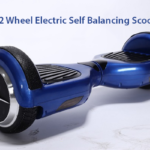 Although it’s not possible to change the direction using the safety handles, they can help you maintain balance while riding the board, maintain the speed of the vehicle, and drag the board when it is out of charge. While purchasing a safety handle, make sure it is compatible with your hoverboard. Made of aluminium, the height of the handles can be adjusted so that it can easily be used by kids as well as adults. 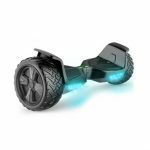 The Premium Smart Hoverboard safety handle by Precise Electronics, Signstek Balance Scooter Safety Handle, and Swagtron Ultimate T+ Hoverboard Handle bar are some of the best-selling safety handles worth considering for your board. Want to make your hoverboard a bit more stylish and free from scratches? The hoverboard protective vinyl skin decals come in various colours and designs, giving your board the chic and trendy look you desire. Made of top-quality vinyl and using ultraviolet-resistant colours, they can withstand fading even with continuous exposure to sunlight. Durable, water-resistant, and available in a wide range of colours and designs, this hip accessory will make your board more attractive and stand out from the rest. In addition to giving your hoverboard a cool appearance, the vinyl skins also offer protection against scratches and dents. These stickers are easy to apply and remove as well. The only thing you need to keep in mind while buying them is to get the size right. MightySkins is a well-known brand that offers an impressive collection of skin decals that can fit almost all models of hoverboards. No matter how careful you are, your hoverboard is always prone to scratches and bumps. So, an even better way to protect your self-balancing scooter is to purchase a hoverboard silicone cover, which is designed to offer extra protection against scratches and damages. Made of good quality, soft and flexible silicone, these easy-to-use covers will cover your board and provide an added level of protection that skin decals or stickers can’t offer. The silicone cases are easy to install as they slide smoothly over the hoverboard without the need for any tool. Another feature of this accessory is that it can also prevent damages due to dust and water exposure. Available in a variety of colours and designs, the silicone covers add a touch of style and beauty to the way you ride. 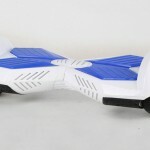 Some of the brands that offer top-quality hoverboard silicone cases include Swagtron, Segway, and Fbsport. One of the easiest ways to carry around a hoverboard is to use a backpack. Although these boards aren’t awfully heavy, carrying one in your hand for a long time can sometimes be tiring. By using a backpack, you can comfortably transport them from one place to another. Being waterproof, these bags can protect your board from all types of weather conditions. The backpacks are mostly made of nylon, and hence, they are easy to wash when they get dirty from the wheels of the hoverboard. The Waterproof hoverboard bag backpack is made of tough and durable nylon material that makes transport of your hoverboard easier. It comes with two adjustable shoulder straps that equally distribute the weight of the board on both your shoulders. You can store the hoverboard charger inside the bag’s mesh pocket. The more you use your hoverboard, the more likely it is to gather scratches and marks. If you wish to keep your board looking new and scratch-free, consider investing on scratch protector guards or hoverboard bumpers. Not only do they protect your hoverboard, but they also give it a stylish look that’s sure to be a head turner. These are basically protective strips that come in various colors. So, the creative riders can mix and match the different colors and give their hoverboards an attractive appearance. The bumpers are attached on top of the wheel covers to reduce the impact during a fall or if the board hits a curb. The scratch protector guards can easily be fitted without using glue, tape or adhesive. Removal of the protector guards is also very easy. If you wish to buy this useful accessory, Go Glide and Scoovy are the two best options worth checking out. With these conversion kits, you can easily convert your hoverboard into a mini go-kart. So, instead of standing up, you can sit down and ride your board. The kit attaches the cart to your two-wheel, self- balancing scooter which functions as the back wheels of the hoverkart. For riding the vehicle, you sit in the cart with your feet rest on the front and then use the pull rods to manoeuvre the board as well as control the speed. Since nylon straps are used to attach the hoverboard, the kit works for hoverboards of all sizes. The straps can be adjusted which means they are perfectly suited for the likes of both kids and adults. For people who aren’t so good finding their balance on the hoverboard, this is a must-have accessory. GoHovertkart, Swegway, and Primo Techno are some of the leading brands that offer the best Hoverkart conversion kits. Taking your hoverboard everywhere you go is not always a feasible option. How can you leave your board somewhere and make sure that it doesn’t get stolen? Well, the best solution is to buy a hoverboard lock that functions just like a bike lock. Using the lock is quite simple. All you need to do is to find a secure and immovable object to chain the board on to, and you can go anywhere you want to. When you’re back, your hoverboard will be exactly where you left it, secure and intact. Made of vinyl coated braided steel, the lock is weather-proof and durable. It is lightweight and self-coiling, making it easy to be carried around in your bag or even in your pocket. While purchasing the hoverboard lock, make sure to select the correct length of the loop to suit your hoverboard size. BestBoardLock is a brand that manufactures hoverboard locks that fit hoverboards of any size. HoverSeat is a fun and safe way to enjoy your hoverboard. This is a versatile accessory that attaches to your hoverboard, making it safer for riders of all ages. It consists of a light aluminium frame that can be fitted to the centre of your hoverboard with the help of a clamp. On top of this frame, you can attach a beach chair or any seat that supports your weight. Riding HoverSeat is very easy. You just need to use your feet to navigate the board. If you find it difficult to steer with your feet, you can buy handlebars that can be attached to the metal frame. This way you can steer with your hands and get better navigation and balance. When riding a hoverboard, safety is of utmost importance. The most common danger while riding these boards is people losing their balance, falling, and getting injured. Such injuries can be avoided to a large extent by wearing protective gears, such as helmet and protective pads for your knees, elbows, and wrists. The Triple 8 Brainsaver Rubber Helmet is an affordable helmet that comes in a variety of colours and sizes to choose from. Lightweight and comfortable, it’s a great helmet of choice for hoverboards. The Smith Scabs Safety Gear provides strong and rigid knee/elbow and wrist protection pads that offer maximum safety to these impact-prone areas. Make your hoverboard riding experience even more fun and exciting with these hoverboard accessories! By protecting your board, many of these accessories help to increase the functionality and lifespan of the device plus ensure you a safe and secure ride. 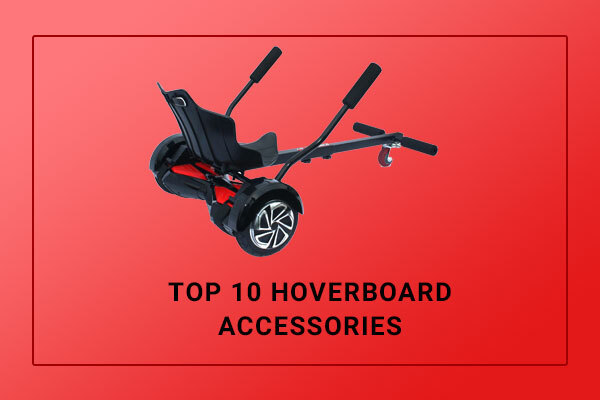 I hope this list has helped you decide what accessories to buy for your hoverboard. If you’re using any other hoverboard accessories, do share the information with us!